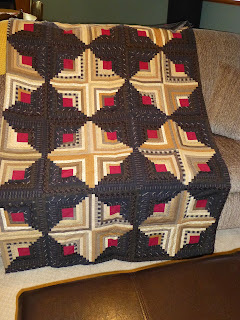 When I was younger I enjoyed making quilts for my home. I still appreciate and love the quilts that I see at places like Country Sampler in Spring Green, but I don't have the sewing skills to make these wonderful creations anymore. 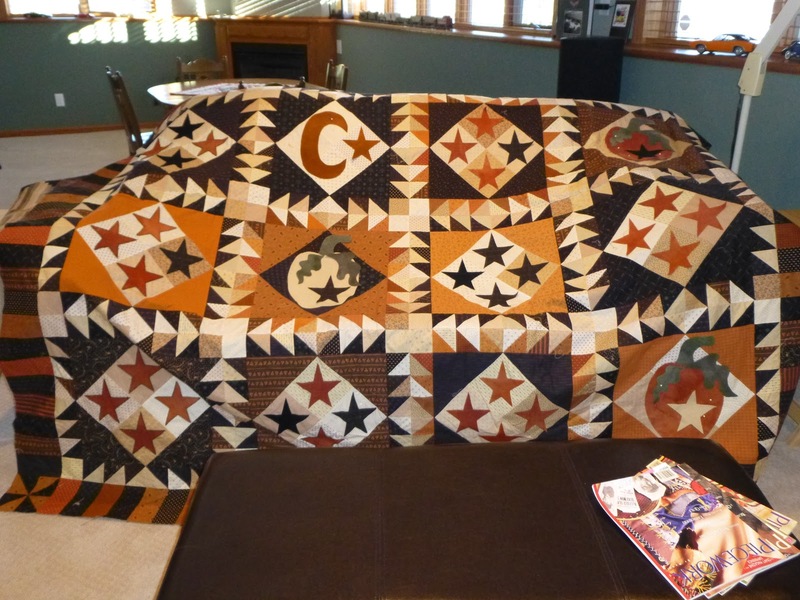 A few years ago, a family member gave me a kit to make a lovely Log Cabin Quilt that I had admired. I dutifully washed the fabrics and started cutting up the strips. After all, I made a pretty log cabin quilt a long time ago for one of my daughters. But, reality came crashing down as I was cutting the strips........they were only 1" wide.....seriously, what was I thinking??? So, away in the cupboard all of the pieces went. Then, my friend and fellow enabler, Judy, told me about her quilt instructor. Denise M. was wanting to start a "piecing" business. Denise recently finished the piecing and it is wonderful. I now need to find someone to do the longarm quilting and it will be ready to display. The photo doesn't do this justice...........any ideas of how it should be quilted? As long as I am confessing my quilt obsessions, I'll share another quilt that Denise pieced for me. This one is a Blackbird Design for Halloween and the kit also came from Country Sampler. I have wool stars and pumpkins pinned onto it and am ever so slowly stitching them down. I need to get back to work on this so it is ready for next fall! Ok, ok, ok..........so I do have another quilt that I want to work on. It's "A Primitive Garden" by Lisa Bongean. Lisa owns Primitive Gatherings Quilt Shop. 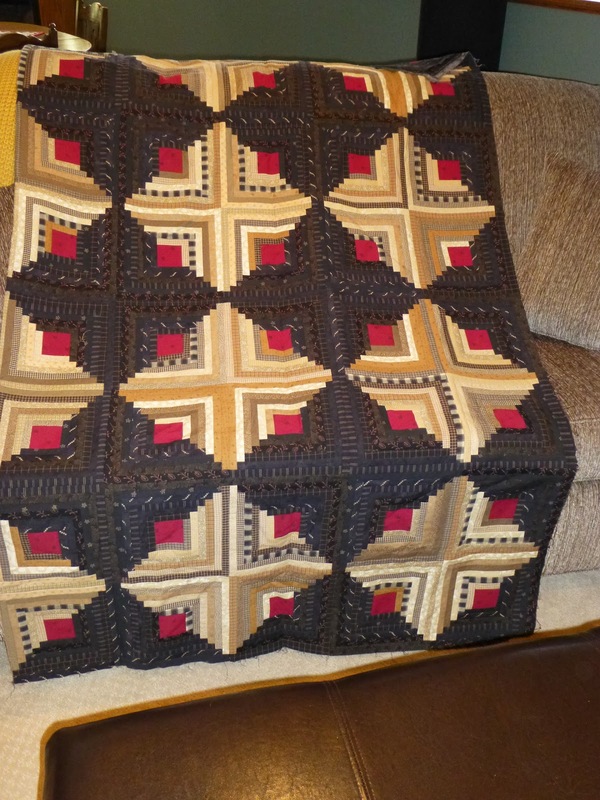 A photo of the completed quilt is shown on page 7 of "Our Designs". I love the combination of wool applique on cotton background fabrics. This previously was one of her block of the month designs, so I have all the supplies to do this, just need to complete a few other projects first!!!! Ok, you're lucky to have someone to piece your quilts for you. lol! I've become very rusty in my piecing skills as well and feel the same way. And yes, I want to make quilts! And stitch at the same time. lol! I love your quilts -- gorgeous! Oh Jane !! You make me want to start quilting, and do I really need another hobby? LOL !! These quilts are just beautiful !!!!!! Thanks for showing them to us. I love your quilts. I'm a former quilter turned stitcher. My fingers just got too old and I liked the hand work. Lovely quilts and a nice business concept - professional quilt piecer. I quilt and embroider. I looked back on your past posts - great projects! I'm now a Follower. Hi Dawn........as you can see, I haven't posted in a while. These quilts are now completed and I mostly work on hardanger and cross stitch pieces now.